To mark International Women’s Day we sat down with some of the women of Paybase! Here at Paybase the split between women and men is nearly 50/50, but we understand this is sadly nowhere near the norm in the FinTech industry. It’s our vision to change payments, and an industry that is more accessible to all is definitely something we want to build towards. We spoke to our female team members to discuss their experiences and what can be done to address the gender imbalance in FinTech. I’m the Head of Compliance and MLRO. I’m basically in charge of ensuring that the company follows all regulatory requirements. That may be anything from how we communicate what we do to our partners up to investigating money-laundering and terrorist financing. I’m responsible for building and implementing the controls that the firm uses to detect and prevent financial crime. Great! And how long have you been working in compliance? 5 years now. I started interning in compliance when I was at law school and stuck with it. What is it that you like about compliance? I like catching the bad guys! Speaking more generally I like problem-solving, making sure what the business wants to do can fit within the regulations. With compliance, it’s vital to set the right company mindset. I’ve seen things go very wrong at other firms that view compliance as an unimportant duty to be thought of later. Here at Paybase we acknowledge and respect the regulations, which allows me to get on with my job of making sure we can achieve our goals from a compliance perspective! Interesting! Sadly, it’s quite uncommon to see women in senior roles in FinTech, why do you think that is? Well, in terms of compliance, you do sometimes have to hold the unpopular opinion - and fight for it. I think men find it easier to be assertive in the sense of projecting their opinion and making sure they get the focus of the room. As a woman you have to be careful to balance asserting your opinion and getting the attention required as it can be perceived as either you are being aggressive, frustrated or too emotionally involved. In fact, you are just passionate about something. I see, and how do you think this problem is best addressed? I think more women in senior management would be a good step, it would lead to a greater understanding of how women approach things and change the shape and tone of discussions for the better. If I raise my voice in a meeting it should be seen in the same way as a male colleague’s, but at previous companies I’ve worked at that was not always the case. More women in charge would alleviate those sort of issues - and then it becomes this virtuous circle: more women in leadership allow more women to reach leadership positions. I’d agree! Do you have any tips for women wanting to get into compliance? My advice would be the same for everyone really! Do some research, read the JMLSG, find out who the big players in the industry are. See if it’s what you’re interested in and go from there! It’s not something you can study specifically, so it’s important to research and decide if it’s something you really want to do - a problem-solving mindset and a desire to do things the right way definitely helps. You’re someone who has worked in different countries, are there any notable differences in your experiences? Definitely. I was working for a company whose CTO was based in the Middle-East and I was told that, as a woman, I wasn’t allowed to speak to him directly. We had to go through an intermediary which, whilst helpful for the language barrier, was ridiculous. It was also frustrating as I was just told that ‘this is the situation’ instead of ‘this is the situation, here is how we’ll help you get around it’. As for the US, employers can discriminate against women by denying them access to basic healthcare and maternity leave is almost non-existent, I think my Mom only got 3 weeks off! Things like this make it harder for women to have a family and continue working - but this is across all industries. Wow! It’s staggering to think that that can still occur! Yeah, the UK is better in that sense. However the pay gap is still prevalent everywhere. When I left a previous job I found out I was being paid £10k less than one of my male counterparts and £15k less than the other. I was less experienced, but we all did the same job. Yep, it’s definitely something we need to change! Thanks for talking to us Danielle! Hello Asma! What’s your day-to-day like at Paybase? I’m a coder! I do all sorts of programming, on both the frontend and backend, so my day-to-day is very varied. It’s something that I really like about my job. When did you get into code? A few years ago. It started out as a hobby, with me taking some online courses in my spare time. I then got a job that provided more training. Soon after, I was here at Paybase! There is a large gender imbalance in the tech world, why do you think that is? From my experience, growing up it’s just not something that’s really presented as an option to you. I don’t just mean in an educational sense, though that definitely is a factor, but culturally. You watch films and TV shows and it’s always little boys playing around with computers and you don’t really see yourself in it. Then you get to school where maybe there would be an after-school club for computer science, but it would be all boys going, so as a teenage girl, you wouldn’t want to go. The whole journey just cements this idea that tech is something which isn’t for you. After all, you don’t want to go into an industry where you don’t think you’ll fit in. That makes sense Asma, so how do you think this could be changed? Media definitely needs to play a role in bringing about change. Kids need to watch films where girls are the techies, and not just one token character (if at all). As for schools, it would be good to see female engineers invited in to talk to the students, so young girls know that this is something that is an option for them. Do you think women have to act a certain way that their male counterparts don’t? Yes, definitely. If you’re a woman simply defending your point can be interpreted differently to how it should be. What I’ve also noticed is that when women in tech make mistakes, they’re more likely to beat themselves up about it whereas men tend to let it go. That probably stems from the fact that women feel they have to prove themselves more. Are there any tips you would give women going into tech, or any examples of situations where you wish you’d done something differently? I’m not sure I’d say differently, but there have been situations where it has been really hard to know how to act. Personally, in the past I’ve had really inappropriate comments from male superiors and it’s hard to know what to do; do you say something and risk making it a really uncomfortable working environment for the rest of your time there (or worse, get fired), or do you not say anything and allow it to go unchecked and get worse. You’re told to speak to HR but that doesn’t always work. It’s hard. It’s something that I’ve left jobs over. At Paybase it’s never been an issue and I think that if companies had as many women in senior roles as we do, that behaviour wouldn’t be tolerated. It’s definitely something to build towards. We’re certainly glad you’re here with us Asma! Hi Anna! Can you give us a little bit of background to your job? Yes sure! As CEO I do a bit of everything. I’m in charge of overseeing the company, making sure we have a clear strategy and that everything we do contributes to that strategy. In a general sense I keep on top of our finances, get involved with our marketing strategy and accompany our Head of Partnerships on important sales meetings. I work with our Head of Compliance to ensure we’re as compliant as we can be and with the CTO to implement our tech strategy. I also liaise with Ops to create company processes and find the best possible suppliers. It’s basically my job to bring everything together - it’s certainly varied! How long have you been working in Fintech? It started back in 2013 when I was working as an investment manager. One company in our portfolio was a FinTech and as an investment manager, you have to know not only everything about the company but also the nuances of the industry. I became very interested in the challenges that exist in today’s payments industry and the opportunities there are to innovate and improve the sector. Interesting! We see proportionately less women in FinTech but even fewer in management and C level roles such as yours. Why do you think that is? The honest answer is I don’t know, because there is certainly no excusable reason for it. 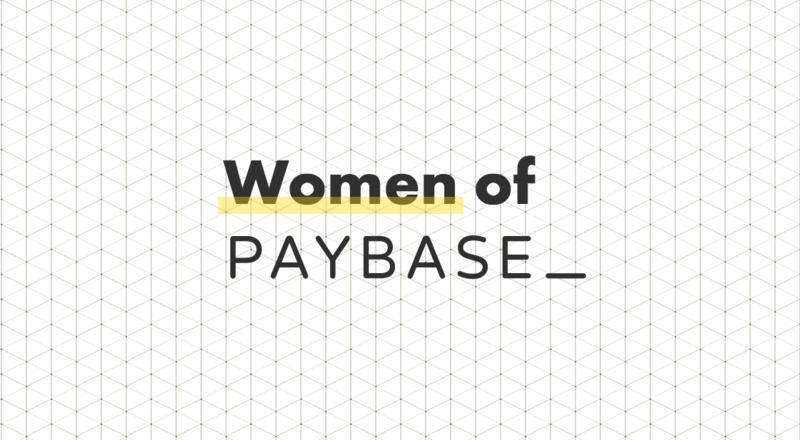 At Paybase we’re more than aware of the contribution women have made to FinTech. We have a gender balance which is nearly 50% and we’re proud of the fact we have women in senior roles doing great things! Are there any other ideas you have to combat this problem? There are certain organisations that exist within FinTech such as Women in Paytech, hosted by the Emerging Payments Association. It’s great that there are communities in which women can discuss these issues and support each other, but that is certainly not the end goal. I strongly believe the best way to solve this by setting the right example - company by company, manager by manager. It’s encouraging women to get into these roles and creating the right environment for them to prosper. Once that happens, the prejudice will fade away - it has to, as it’s baseless. Have you ever had issues being a female FinTech CEO? There have certainly been times when I’ve been in an external meeting with our CTO, who is a man, and others in the meeting look at him only when talking to both of us or even when responding to one of my comments. Additionally me and our Head of Compliance Danielle have been in meetings before where men have explained to us what money-laundering is and why it’s bad, as if it were something we weren’t aware of. Certain comments I’ve received, “pretty little thing”, I can definitely do without. As I say, hopefully the more we see women in these roles, the quicker this type of behaviour will disappear - it certainly needs to! Thanks for your insight Anna! Hello Jarina, could you give us a bit of insight as to what you do? Well generally speaking, Ops is there to make things happen. I coordinate between different departments making sure that all necessary parties are involved in the decision making process, and that everything progresses smoothly and efficiently. I see! And how long have you been working in this field? Ops and project management? 6 years now! So you clearly enjoy it! Yes, I always like finding improved ways of doing things or designing something to be more efficient. I think Ops sometimes gets overlooked as it’s not always strategy focused, but a strategy is only as good as its implementation! Well we certainly value it here! How is it being a woman in Ops? Do you feel there is a gender imbalance? Ops is very broad and will differ across industries, so it’s hard to make generalisations. What I would say is that it’s definitely true that we see fewer women in senior positions. Well, there aren’t enough female role models in these types of roles. When we do see women in high level positions they tend to be portrayed in a certain way - stern, fearsome, someone who has sacrificed family for career. I think a lot of women don’t see themselves that way so don’t go for these types of roles, which is a shame. Talking about FinTech more specifically, I think the lack of women has a lot to do with its parent industries. Finance and Technology have always been male dominated and I think that has trickled down. However, for that reason I also see great opportunity. FinTech is still such a young industry, we have the opportunity to mould it and not repeat the mistakes of the past. If we can get women in these types of roles now, creating more role models, we could make FinTech a much more accessible industry for women of the future. Good point! You’re Swedish and used to work in Dubai, have you noticed cultural differences when it comes to women in the workplace? Dubai is the most progressive in the region, but it’s certainly true there could be more women in senior positions there (from my experience at least). As for Sweden, it tends to be at the forefront when it comes to gender equality, with a good example being the generous parental leave that has to be shared amongst the couple. Good old Sweden, thanks Jarina! I'm a Systems Engineer or DevOps Engineer - I build the infrastructure our platform sits on and other tool stacks such as monitoring, alerting and incident management. Excellent, and how long have you been in tech? This is officially my 4th year in the industry however I was consulting before and that's a more aggressive, less friendly environment. I spoke to Asma about why we see so few women in tech, what are your thoughts? I think there are many, many reasons, but it does begin from the early years at school. Young girls were (I'm hoping this is changing) not as encouraged to follow science, maths or computing - it's perceived more of a "boys thing". This results in fewer women studying such degrees and even fewer getting into the industry. Then the very few women that enter the industry have a hard time in most companies they join because many men (and even sometimes other women) are biased towards them. Without more women in these roles changing the opinion, the situation remains the same in many places - it’s a bit of a vicious circle. Yes Asma also said it started young, how do you think we should address the problem? We should start with schools and teachers - if we empower young girls and tell them that science and maths can be fun and they can do it too that would be the first step in my opinion. Then for the women already in the industry we need to break the bias. One way of doing this is for everyone to acknowledge that in tech there are both very talented men, and men that struggle a little more. Currently, nobody really thinks about the men in tech that are not as talented; they either change industries or they remain in the shadows. The same doesn't apply to women. If a woman struggles, it’s because she’s a woman, which negatively impacts how all other women in tech are seen because there are so few of us. I see, do you have any tips for new female techies? Yes, a few that really helped me. When I joined the tech world and I was in my early twenties I had the tendency to go along with sexist jokes and laugh and smile when other men in tech would objectify women - I just wanted to fit in. But I'm not proud of it looking back, as by going along with it I was hurting all women in tech including myself. Luckily I’m no longer in an environment that’s remotely like that, but if I ever were again I’d certainly make my thoughts known. My second piece of advice would be to build a support group. Having someone who understands the issues, listens and makes you feel better is very important. It doesn't have to be just women in your support network, there are men who have witnessed women in tech being subjected to certain treatments that also understand the issues. Also, don't take it personally if people don't believe you initially - I have a very good friend who didn't believe that it was hard to be a woman in the industry until she joined herself. Would you argue that having more women in tech would be something that would benefit everyone? I absolutely agree that nobody should hire women in tech for the sake of numbers and diversity but it is very beneficial to have a diverse team - because you're bringing different perspectives to approaching problems (and here I’m not just talking about women). However, I also think you're better off having a team of only men than hiring a woman that is struggling or is not ready to take on the job. If you're hiring just for the sake of diversity you're doing more harm than good, you're increasing the bias and nobody wins. That makes sense. What has been the most challenging thing you’ve had to overcome? Would you do anything differently? Being told I was only hired because I was a woman and initially believing it. That was a week into my previous job. Luckily I had, and continue to have, a really good support group that picked me up. It was only when I completed a customer engagement on my own that the company began to realise that they were wrong. After that, they tried very hard to get me to stay. In terms of doing things differently, I should have perhaps gone to HR as opposed to my managers that didn’t seem to care, though truthfully I’m not sure it would have helped that much. The person who said that to me continues to work at the company, has been promoted a few times and continues to act in the same way even though I confronted him and he said he was wrong. To be honest, working at Paybase is the first time in my career that my only problems are engineering problems. It feels great, it makes me want to grow and be a much better engineer than I am today. Wow! Glad to hear you’re enjoying it here Ana! So whilst some progress has been made, there clearly remains a lot to be done. Hopefully the suggestions of our employees and other women in FinTech are listened to and this generation can make FinTech an accessible and enjoyable industry for all. We at Paybase do all that we can to help women progress in FinTech, primarily through being an example on how effective a diverse team can be! If you’re interested in working at Paybase (whether you’re a man or a woman) please get in touch!